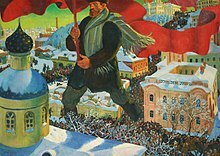 The October Revolution,[a] officially known in Soviet historiography as the Great October Socialist Revolution[b] and commonly referred to as the October Uprising, the October Coup, the Bolshevik Revolution, the Bolshevik Coup or the Red October, was a revolution in Russia led by the Bolshevik Party of Vladimir Lenin that was instrumental in the larger Russian Revolution of 1917. 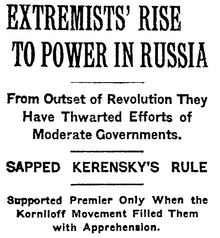 It took place with an armed insurrection in Petrograd on 7 November (25 October, O.S.) 1917. 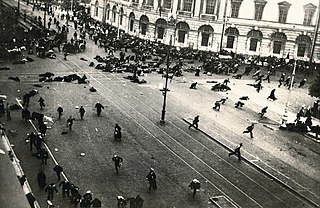 Soviet government archives show that parties of Bolshevik operatives sent from the Smolny Institute by Lenin took over all critical centers of power in Petrograd in the early hours of the first night without a significant number of shots fired. This was completed so efficiently that the takeover resembled the changing of the guard. 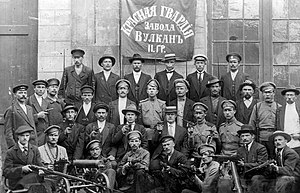 There was not much of a storming of the Winter Palace because the resistance basically did not exist and at 2:10 a.m. on 26 October (8 November new style) 1917 the Red Guards took control of the Winter Palace. The Cossacks deserted when the Red Guard approached, and the Cadets and the 140 volunteers of the Women's Battalion surrendered rather than resist the 40,000 strong army. The Aurora was commandeered to then fire blanks at the palace in a symbolic act of rejection of the government. The Bolsheviks effectively controlled the almost unoccupied Winter Palace not because of an intense military barrage, but because the back door was left open, allowing the Red Guard to enter. 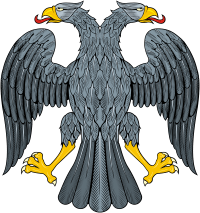 The Provisional Government was arrested and imprisoned in Peter and Paul Fortress after the ministers resigned to fate and surrendered without a fight, and officially overthrown.